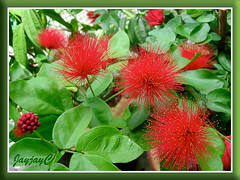 Calliandra emarginata ‘Red’ – the explosive beauty! Such a spectacular potted bush this lovely Dwarf Powder Puff plant is when in flower! 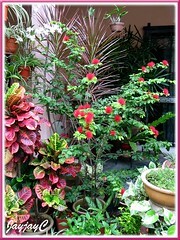 A profuse and frequent bloomer, its fabulous and bright red flowers absolutely brightens our garden corner. We bought it about 2 years ago at a height of only 10″ and it has now shot up to almost 6 feet! Even as a young plant, it was already blooming to our greatest delight! 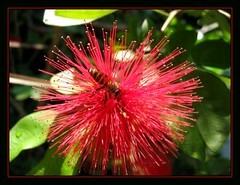 Currently, our Calliandra emarginata shrub has fired again! Etymology: The genus name, Calliandra means beautiful stamens in Greek, alluding to the numerous long slender stamens in its globose inflorescence. 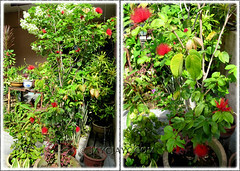 Features: Calliandra emarginata is an attractive species of the genus Calliandra that consists of about 200 species of flowering plants that are native to tropical and subtropical regions of southern Asia, Africa, Australia and the Americas. This perennial plant is a medium-sized erect shrub or small tree that can grow up to 7 feet tall or more, with a spread of 3-4 feet. Foliage is medium green, with the younger leaves a tad lighter and emerging shoots with a light burgundy tinge. The leaves are kidney shaped, appearing in pairs and evergreen but may be semi-deciduous in cooler regions. Quite fascinating to notice their leaves folding when the sun sets. 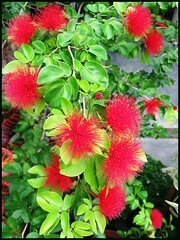 A prolific bloomer that produces brilliant red powder-puff-like blooms with numerous and conspicuous stamens grouped delicately together in a ball-shaped inflorescences. Think of mimosa flowers for resemblance! 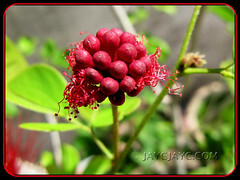 These attractive red globular flowerheads are 2.5 inches (6 cm) across and present a wonderful contrast against its light to medium green foliage. Occasionally, green seedpods will set and turn light brown when mature and explode to scatter its seeds. 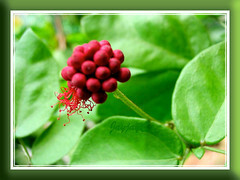 A wonderful perennial shrub that blooms almost throughout the year. Flowers are short-lived, lasting a day or two but their abundance and radiant colour is enough to offset that and sure to woo you! There’s a lovely variety with bright pink flowers too. 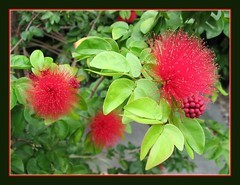 Culture (Care): Calliandra emarginata is relatively easy to grow and requires minimum maintenance. Moisture: Requires moderate water regularly, loves damp soil. Soil: Best in moist soil, but must be well-drained. Others: Quite fuss-free! All it need is lots of sunshine, humidity and sufficient water as required. A monthly fertilizing regime is beneficial. Prune the shrub to maintain a reasonable size or to shape into a lovely round bush. 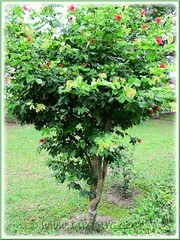 It can be trained into a small standard tree or flowering bonsai too. No deadheading is required as the blooms dries up and eventually falls to the ground, helped by the rain and wind. Most attractive to butterflies, bees and other winged insects. So far, no infestation by mealy bugs or white flies on our plant. For subtropical and temperate regions: Hardiness: USDA Zone 10a-11. However, gardeners in Zone 9a whose plants froze to the soil in winter had them revived in spring – check it out at Dave’s Garden. If unsure, best to plant it in containers and overwinter indoors. Provide sufficient light, warmth (minimum 60°F) and reduce watering in winter – more info at gflora.com. Propagation: Propagation is easier from seeds found in its flattened pods, though semi-hard stem cuttings are possible as well. It’s easy, just push the stem cuttings (remove most of its leaves) or seed into potting soil, place pot in a semi-shaded area, water regularly and you’ll reap results! Calliandras are wonderful. I love them. Would it be possible to send me some seeds? I could pay through PayPal. I’m growing calliandras of different colours. They’re still in the seed pots. Sorry, Milouska…we don’t have seeds for sale! We’re not a retail nursery, just sharing information on tropical plants. I recently planted powderpuff in planter. Blooms appeared to be drying up and now have turned brown and fell off. Will more appear? Greens seem to be healthy. Good sun and water? Hi Barbara! 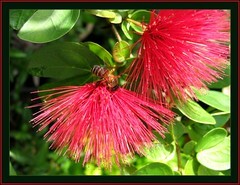 Though Powderpuff is a prolific bloomer, each bloom is short-lived, lasting about 2-3 days. It enjoys full sun, regular watering and humidity. I have a Powderpuff. 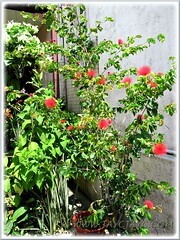 She has bloomed several times, and I look forward to each bloom. Because of the cold nights I bring her into the bathroom that has a nice sunny window. I water her, fertilze her as I am suppose to. Last month, I twash the river rocks in her pan. Now that spring has arriveds, she has plenty buds. She looks healthy, but has started gets brown on the tips of some of the older leaves. I named her “Baby Girl” because she is still small. I don’t think that’s normal, Carolyn… unless the older leaves are withering and falling off naturally. Overfeeding can cause brown tips on foliage.